Who Will Win the 1st Semi Final T20 Match, Between LAN vs WOR and Toss Prediction? Lancashire is all set to take on Worcestershire on Saturday, September 15, 2018. In Today’s Dream11 Fantasy Cricket Match of LAN vs WOR 1st Semi-Final T20, Vitality T20 Blast 2018, we will cover Pitch Report of Edgbaston, Birmingham, Predicted Playing 11, Toss Prediction, Fantasy Cricket News and Tips and Who Will Win? You May Like to Read T20 Blast Prediction. Worcestershire has played 14 matches, won 9 and lost 4 matches. They finished at the 1st position in the points table with 19 points in their pocket. On the other hand, Lancashire played 14 matches, won 8 and lost 5 games. They finished in the third position in the points table in the league stage with 17 points in the pocket. According to our astrology prediction, LANCS will win the match today. The team winning the toss should opt to bowl first as chasing will be comparatively easy on this ground. According to our astrology prediction, LAN will win the toss and invite WORCS to bat first. 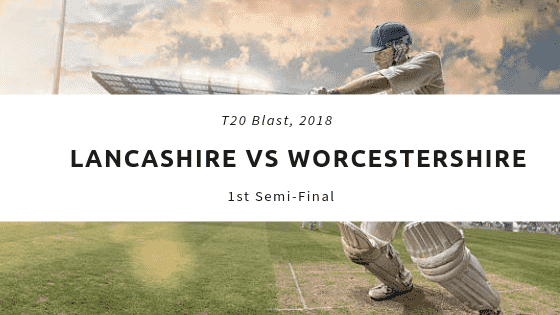 Match: T20 Blast, 2018, Lancs vs Worcs, 1st Semi-Final. Time: 10:00 AM GMT, 03:30 PM IST, 11:00 AM LOCAL. This season seven-match has been played on this ground and four matches have witnessed 200+ scores. The pitch of Birmingham, Edgbaston generally favours the batsmen and is a batting friendly ground. The ball comes to the bat and the batsmen can easily play on the rise shots. The pitch will also favour the fast bowlers in the initial couple of overs. Fantasy Cricket Tips: Try to take top order batsmen and fast bowlers in your team as the pitch is expected to be a bowling-friendly. The dew may come into play in the second inning. Cloudy, Partly Cloudy and Mostly Cloudy. This is how the weather is going to be Birmingham. There is no sign of rain. It is expected to be a pleasant day. The temperature is expected to be 17-Degree Celsius and the humidity to be 74%, which may go down to 63%. If we look at the last five matches, Lancashire has won two matches out five matches whereas Worcestershire has won one game out of five games and two matches were abandoned due to rain. In the last encounter, Worcs defeated LANCS by 5 wickets with 1 ball remaining. JM Clarke, CJ Ferguson and BL D’Oliveira were the key performers of that match. The average first inning score of this ground is 169. The average second inning score of this ground is 151. Highest total on this ground is 221/5 in 20 overs by ENG vs AUS. Lowest total on this ground is 144/10 in 18.4 overs by AUS vs PAK. The fans using iPhone, iPad, or other Android smartphones can watch the live match of LAN vs WOR on NOW TV and Sky Go. Keaton Jennings, Jos Buttler, Liam Livingstone, Jordan Clark and Matthew Parkinson are the key players of Lancashire Team. Liam Livingstone will lead the LAN Team. Lancashire has named 17 Player Squad for the 1st Semi Final. Liam Livingstone has joined the team after injury. Jos Buttler and Keaton Jennings will also play today. Lancashire will face the selection problem as all the key players are available. Liam Livingstone, Zahir Khan, Jos Buttler (wk), James Faulkner, Keaton Jennings, Jordan Clark, Arron Lilley, Dane Vilas (c), Matthew Parkinson, Alex Davies, Toby Lester. Liam Livingstone (c), Mark Watt, Jos Buttler, Saqib Mahmood, Karl Brown, Graham Onions, Jordan Clark, Steven Croft, Keaton Jennings, Alex Davies, Toby Lester, James Faulkner, Arron Lilley, Zahir Khan, Matt Parkinson, Danny Lamb, Dane Vilas. Brett D’Oliveira, Moeen Ali, Wayne Parnell and Patrick Brown are the key players of Worcestershire Team. Moeen Ali will lead the WOR team. Martin Guptill will not play due to the hamstring injury. Callum Ferguson and Travis Head will also not play as they have returned to Australia. Moeen Ali (c), Wayne Parnell, Brett D’Oliveira, Ben Cox (wk), Joe Clarke, Daryl Mitchell, Luke Wood, Ross Whiteley, Patrick Brown, Ed Barnard, Olly Westbury. Moeen Ali (c), George Rhodes, Ben Cox (wk), Olly Westbury, Joe Clarke, Daryl Mitchell, Brett D’Oliveira, Patrick Brown, Ross Whiteley, Dillon Pennington, Ed Barnard, Thomas Charles Fell, Luke Wood, Andy Carter. Conclusion: This is it for Today’s Dream11 Fantasy Cricket Match Prediction of LAN vs WOR, 1st Semi Final, which will be played on Saturday, September 15, 2018. We have covered all the details required to win any fantasy leagues. We have covered players recent and past performance, dream11 guru and crictom prediction, all the latest news and updates of Lancashire Team and Worcestershire Team, weather report of Birmingham, dream 11 best teams, keys players, the best choice for captain and vice-captain, where to watch the live match of WOR vs LAN, 1st Semi-Final and the details of live streaming of T20 Blast, 2018.